It's the one time of the year! Survivor Series 2018 has begun with a build of only two episodes in total. It comes as a surprise because Survivor Series is usually viewed as the fourth most important PPV of the year. However, with so many specials squeezed in between October to November beginning, WWE has had to compromise with the build. This hasn't stopped them from making some very interesting teams, however. Acting RAW General Manager Baron Corbin made the announcements about the inter-brand Men and Women's traditional Survivor Series match-ups. While it was initially believed that there would be no Tag Team elimination match, it was confirmed on 6th November episode of SmackDown Live that there would, in fact, be a tag team elimination match. However, with it being less spoken about, there is a possibility that it's put as a special attraction match on the Kick-off show. 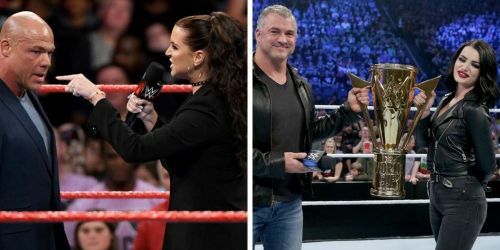 On the 12th November episode of RAW , Finn Balor defeated Dolph Ziggler and Stephanie McMahon told him that he was a part of team RAW. Bobby Lashley defeated Elias on 12th November to become the final member of the team. Kurt Angle failed to become team captain after losing to Drew McIntyre on 5th November. What's weird is that there's only one babyface on the team. Sasha Banks and Bayley battled it out for the final spot but both were attacked by the rest of the team, leading Alexa Bliss to announce Ruby Riott as the last member. Bobby Roode & Chad Gable won a battle royal to become team captains. Samoa Joe defeated Jeff Hardy to earn the final spot. Randy Orton was surprisingly excluded. It comes as a shock because he has the best Survivor Series experience and record on the entire roster. Quite a strong team, considering Becky Lynch is in a bigger match. Charlotte Flair naturally, is the perfect captain and having Asuka will be a huge boost to the team as she was sole survivor for team RAW last year! The Usos defeated The New Day to become the team captains. They instantly gave a show of respect after the match, acknowledging the intensity of their rivalry and picked them for the SmackDown Live team.